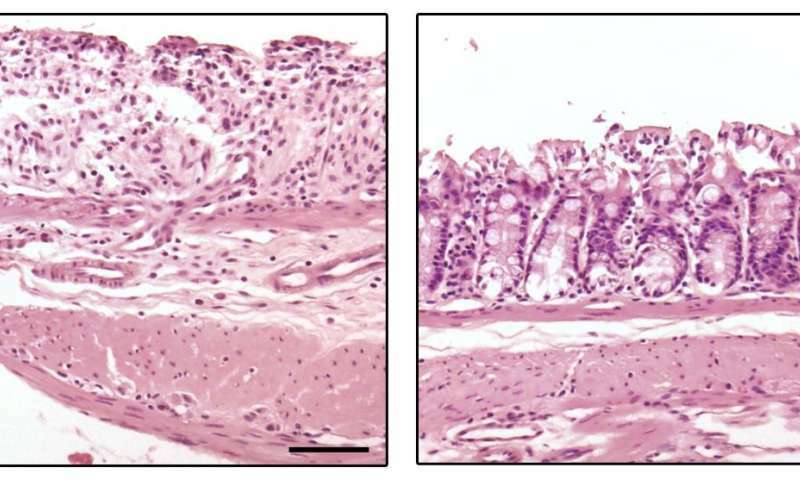 An international team of researchers has discovered that a microRNA produced by certain white blood cells can prevent excessive inflammation in the intestine. The study, "Myeloid-derived miR-223 regulates intestinal inflammation via repression of the NLRP3 inflammasome," which will be published May 9 in The Journal of Experimental Medicine, shows that synthetic versions of this microRNA can reduce intestinal inflammation in mice and suggests a new therapeutic approach to treating patients with Crohn's disease or ulcerative colitis. Inflammatory bowel disease (IBD), including Crohn's disease and ulcerative colitis, affects almost 2 million people in the US. Although IBD is caused by a complex mix of genetic and environmental factors, it is thought to be initiated by an excessive immune response against bacteria in the gut. This immune response involves the recruitment of various white blood cells, such as neutrophils and monocytes, into the intestine and the activation of a protein complex in these cells known as the inflammasome. The inflammasome, in turn, activates the proinflammatory signaling molecules IL-1β and IL-18, which stimulate the further influx of white blood cells. MicroRNAs are small RNA molecules that can bind and repress protein-coding messenger RNAs. An international team of researchers led by Eóin McNamee at the University of Colorado-Anschutz Medical Campus found that IBD patients showed increased levels of a microRNA called miR-223 during active bouts of inflammation. This microRNA was also elevated in laboratory mice with colitis. miR-223 is produced by neutrophils and monocytes and has previously been shown to repress the messenger RNA encoding NLRP3, a key component of the inflammasome. McNamee and colleagues found that mice lacking miR-223 expressed higher levels of NLRP3, causing increased IL-1β production and enhanced susceptibility to intestinal inflammation. In contrast, mice treated with lipid nanoparticles containing synthetic RNA molecules that mimic miR-223 showed lower levels of NLRP3 and IL-1β and were accordingly protected from experimentally induced colitis. "Our study highlights the miR-223-NLRP3-IL-1β regulatory circuit as a critical component of intestinal inflammation," McNamee says. "miR-223 serves to constrain the level of NLRP3 inflammasome activation and provides an early brake that limits excessive inflammation. Genetic or pharmacologic stabilization of miR-223 may hold promise as a future novel therapy for active flares in IBD."